Jade Bloom's proprietary blend of SUTURE just got even better! 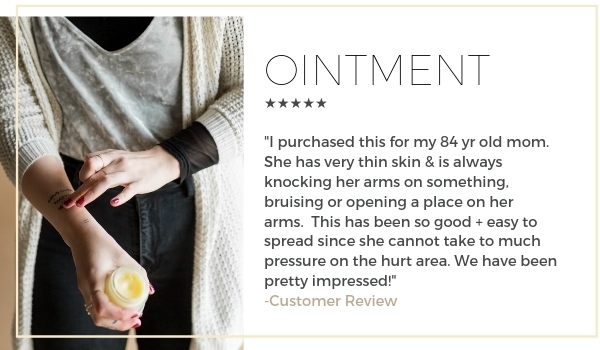 Customers have been raving about the benefits of SUTURE so we decided to make an all natural version of Neosporin that was both easy to use and safe for the whole family. *For open cuts and wounds be sure to wash thoroughly before applying SUTURE Healing Ointment to help minimize the risk of infection and improve the effectiveness. 1. To increase the potency of this ointment, you can add drops of SUTURE Healing Blend Oil directly to the jar and stir. You can purchase SUTURE Healing Blend Oil by clicking here. 2. You may keep this jar in the refrigerator if a harder consistency is preferred. More About Jade Bloom's proprietary SUTURE Healing Blend oil used in this ointment. Topically - Add 2 to 3 drops onto a wound before applying a bandage for added protection or massage 2 to 3 drops into a healing scar twice daily. Love this cream. Applied to my son's eyebrow twice a day when he busted his eyebrow and now he hardly has a scar. My husband gets very painful long cracks on his fingers every winter and we have tried every over the counter cream and ointment that we could find. Nothing really worked. I pulled this little jar out of my mini oil fridge and thought let’s give this a try. He applied the suture ointment to all of those long painful cracks and wore aloe gloves that I picked up at Bed Bath and Beyond. I saw him reapplying the next night before bed. He loves it! We will never be without this miracle in a jar. Thanks Jade Bloom! I prefer to use this whenever I have a cut or scratch. I even used it on a dry patch on my cheek. It's very generous in size and at first I did not care for the scent..but now I am in LOVE with the scent and I need to open it to smell when Im not using it. Will purchase again when the other one runs out. My baby got a cut on his lip and this product helped him heal so quickly while being natural enough for him. A must have on a medicine cabinet! All summer we were working on property putting up fencing for our horses and any cuts I used this, we had plenty to test product quality and it worked amazing. Lasts forever too! I had received a million bug bites on a recent night kayaking trip. They were so bad that they were starting to scar. I came home from the trip and started using this and away they went. I had a scar on my elbow that has had trouble healing over a week's time. Once I started applying this, I noticed an immediate result. We have used on minor cuts or abrasions and they have healed nicely. I for some reason this Summer have had the most HORRIBLE case of severe dry skin in my nostrils area and no matter what cream or DIY thing I tried it persisted. I was sent a stick of "Suture" with my Collectors Club order a couple months ago and so i decided to try it on my dry and skin and it took the issue away completely as well as soothed it immediately. Love Suture healing ointment. I burnt my forehead with my curling iron so I put the Suture Healing Ointment on it right away. Healed up nice. I also used it on an ingrown toenail and it helped to soften the skin around it and helped with the infection. Our family relies on this year round for scratches, pimples, you name it. 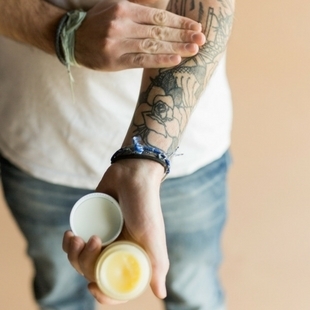 We made a healing salve with suture, frank, lavender, black seed oil, coconut oil, and organic beeswax--use it on just about everything including dry cracked knuckles. This is now, along with the lavender healing ointment, my family’s replacement to traditional triple antibiotic ointments. We love knowing it’s safe and natural. You can tell when you start switching over to natural products...you benefit. I bought both oil and ointment at the same time, l use Both ointment at the same time, for a little bit now l use them at Different times , again both are Great and lm new to Jade Blooms oils and use Young Luving oils, most of the time. But plan to buy the Mother’s Day gift set you have up right now. Thank so very much. A customer Jeannie Chavez’s hooked my up with you folks. One Happy Lady here. So much easier to use the ointment than the oil. I have both and they both have their uses. I don't have much time for making my own ointments and blends so I love that Jade Bloom made this into an ointment. I am so glad, I purchased this! Will be a permanent staple for now on! A must have household item! I love this ointment--it works so well for bruises, cuts, scrapes, and even those scratches that you get from your cat at times. :-) It is so soothing and really helps to heal the skin. I won't buy Neosporin ever again! I purchased this for my 84 yr old mom. She has very thin skin and always knocking her arms on something and bruising or opening a place on her arms. This has been so good! And easy to spread since she cannot take to much pressure on the hurt area. We have been pretty impressed! Some years ago, I found out I was allergic to the active ingredient in Neosporin (a topical antibiotic). The skin on my hands is very thin and dry (partly due to arthritis) and whenever I got even a small cut or scrap, it often would become infected. Then I discovered the Suture Ointment. I recently cut my right hand rather badly. I applied the Suture Ointment at night and was thrilled to find the next morning that my hand was already healing nicely! This product is truly a lifesaver! I'm really happy to have a safe and effective ointment to use on cuts, scraps, and bruises for my family!! I've used it several times already, it's the yearly roller skating gym time at our elementary school, so there have been a lot of scraps!!! I'm keeping this on hand! I already loved the Suture essential oil, but I really love that there's now an ointment with it in it! The oil worked wonderfully for my husband's scar after knee surgery and now my mother-in-law is using the ointment after spinal surgery. It says on her skin longer and really helps soothe the itching and the scar is healing BEAUTIFULLY! I also use it on just minor cuts and scrapes and they seem to disappear overnight. Good job, guys! Great to use on kids everyday cuts and scrapes.Smells great. Love the healing ointment especially on my hands when I have cracks on them . Not only did this help my cut heal quicker, it smells great! I had a cut from the metal pour spout on BIZ and it was heading into the 5th day with no closure or pain relief and bright red I was using DOTERRA correct-x. I remembered that I had just purchased suture blend ointment. I washed my Thumb and applied a tiny bit, and within 3 hours the cut was closing, pain and redness were both gone. Later I applied it again before bed and woke up with the cut completely closed and healed by 75%. Yay, I am so grateful to have Suture on hand!!! Thank you Jade Bloom! This is great for wounds. I only used this on two punch biopsies I had done, no Neosporin. It worked just as well! Amazing! I already had the oil so when the ointment came out I knew I had to have it. I splattered very hot grease on my chest a few weeks ago. I immediately grabbed the suture oil and rubbed all over the area. Immediately the pain was gone and it was healed in a few days. Love the ointment too. Used it on a cut and was healed in a couple of days. My daughter picks her scabs and they get reopened and infected. She also allergic to band aids and i use this three times a day until it healed. Takes anywhere from 3 to 5 days. A must have and great product. It is replacing my neosporin. C-Section Scar is almost invisible. I had 3 babies in 3 years via C-section. I place this on my C-section scar and it has helped to heal it so much so that you can hardly see my scar anymore. Also, many of the oils are great for cell regeneration in this ointment, and I often rub this on the tops of my hands to get rid of the "crepe" look and also on my eyebrow area. My eyebrows have become thicker and healthier looking. On hand at all times! Fast healing ointment. Great for the whole family. Tried this on husbands bites he had. We have no idea what bite him. He had bites all over his legs. They were itching and getting infected. This stopped both. I also have a scar from surgery that was red and was hurting. Put ointment on. Looks a lot better now and not hurting. The rollout of this product was extremely convenient, as I had just run out of my regular tube of antibiotic ointment. I always like to have some on hand just in case. Soon after I received it, I had a few cuts on my fingers, used this Suture and a bandaid, and it was very soothing. I love the scent as well! I even used it on my boyfriend recently, when he lost some skin from a pressure hose at the carwash. A must have for your first aid kit! I love Suture salve. Heals quick. I had cut my hand, skin peeled back. I used Suture salve for 5 days. Started healing good in 4 days. To me this is quick because I am diabetic. It usually takes 2 to 3 weeks to heal. Another must have for me. I'll never run out of this. We bought this out of curiosity, and absolutely love it. We live on a farm in North Texas and the fire ants are a constant problem. This product knocks out the pain and itch almost immediately, and the site is clear the next day. Can I order this stuff by the gallon? I just purchased this recently and it came it to use immediately. I had a cut on my finger, I cleaned it, applied some Suture and honestly, the next morning my cut was almost healed!!! This is a fantastic product. Very happy this product came out because I love Suture! Sometimes the oil can be a little hard to get out if you shake it too hard sometimes you end up hitting the wound and making it worse. I ordered this for some deep cuts caused by our puppy who demands attention. He left my arms very scratched, some deeply. I've used this product for a month now and just recently got my sister one! It's fabulous! It has helped heal this deep cuts as well as minimized the scarring. Anyone with abrasions, cuts, sores, etc, should try this product! Better than Madera and a little goes a long way! Awesome!! Healed my cuts fast!